FreedomPop arrived on the scene last Fall, promising to change the way you access Internet. The whole message of FreedomPop has been to change the way you pay for services as well as the high-end, ridiculous amounts of money you pay for your monthly data bill. The Sprint MVNO is convinced that most smartphone consumers are getting ripped off each month, and wants to change that. Look out carriers: FreedomPop strikes again! FreedomPop is looking to change the money you pay for calls, texts, and web surfing each month. 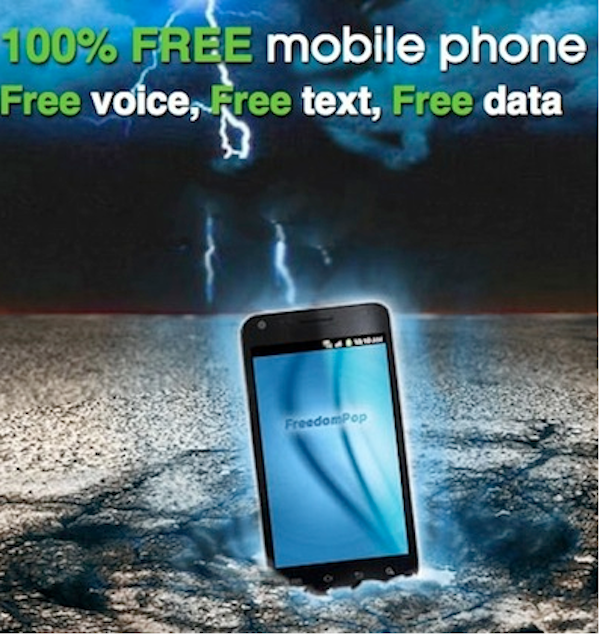 Let’s dive in to FreedomPop’s new plan. Similar to its web data, FreedomPop will now offer a free, 200-minute voice plan for those who choose to sign up for the company’s new phone service. For those who want more voice minutes, you can pay an additional $10 fee for unlimited voice minutes for the rest of the month. Who knew a phone bill could come so cheap? FreedomPop’s data plan has always been simple to remember: the company awards each new signee with 500MB of free data each month. If you go over the 500MB, the company charges you $10 per additional 1GB of data. With FreedomPop’s new plans of voice, texting, and data, you no longer pay the majority of your bill for voice and texting. Now, with FreedomPop’s affordable plan, you pay for the data you afford. According to FreedomPop CEO Stephen Stokols, 2GB of data will cost you $17.99 each month. Currently, 2GB of data with FreedomPop is $20 a month, and that doesn’t seem likely to change with the new data plans. As it stands currently, users who sign up for the new voice, texting, and data plan will still get to select their data plan amounts and pay extra accordingly. In other words, if you like Sprint’s coverage in your area, you can have a Sprint bill and network plan each month that matches T-Mobile’s. FreedomPop is on its way to challenging T-Mobile’s “UNcarrier” campaign. As with everything in life, there are caveats. It is no different with FreedomPop’s new voice, text, and data plan. One such caveat pertains to Sprint’s network. If you live in an area where coverage is optimal, then FreedomPop will work beautifully. If you don’t, then you may wanna stick with your current carrier or MVNO. Alongside of the Sprint question comes the technology used for voice calls. Sprint’s 3G network will be allotted for voice calls with FreedomPop (VOIP calling), so you will not have that perfect voice call — although it may work for you when you need it. If you’ve been on T-Mobile’s 2G network and made calls, Sprint’s 3G will work better so don’t sweat it. Next, you will have to purchase a Sprint phone in order to enjoy the benefits of the network. Sprint phones will cost somewhere between $99 and $199. Right now, only Sprint phones will be compatible, although FreedomPop says it is willing to get other phones on the network over time. The iPhone, then, will not be compatible for the time being. On the other hand, it has been reported that Boost Mobile, another Sprint MVNO, will get the iPhone this Fall, so you may wanna check into that. FreedomPop has said that it intends to start the phone service sometime in August or September, so continue to visit Tapscape, as we will report on FreedomPop again when more information surfaces. Visit www.freedompop.comfor more information.